At a previous Sabres Blogging Summit Ted Black made mention of the organization preparing to undertake the renovation of the 100 Level of First Niagara Center. Nearly two seasons have passed since he first touched on the possibility and it’s quite possible that the team has put those plans on the back burner. Exactly what would be on the to-do list is up for debate as there would be some physical challenges posed by the construction of FNC along with whatever budgetary restraints the organization chose to attach to the plan. More history and (maybe) more space would be key additions for The Aud Club. As the official pipe dream author of the Basement Brigade I thought I’d toss out my wishlist of what I’d hope to see incorporated into a renovated 100 Level if and when the Sabres finally undertake the project. Remove the Plays on the Floor: I’ve never been a fan of the drawn out plays on the floor in the two large common areas near the atrium. They’re difficult to discern and you need to be on the Club or Suite level to get a sense of what you’re looking at. I’d gladly see the organization simply remove them and move onto a different way to showcase famous plays. Interactive Zones: Instead of painting Xs and Os schematics of plays why not replace some of the static advertising blocks throughout the concourse with an interactive section or two that catalogs the great plays in the history of the building and the Aud? The loss of advertising revenue from the large panes could easily be replaced by attaching a sponsor to the interactive areas. The key would be putting in large screens that allows everyone in the area to see the play. It would also be a shame to just include Sabres plays. The Bandits call the arena home and First Niagara Center and The Aud have both seen some memorable moments whether from the Braves, college basketball or otherwise. 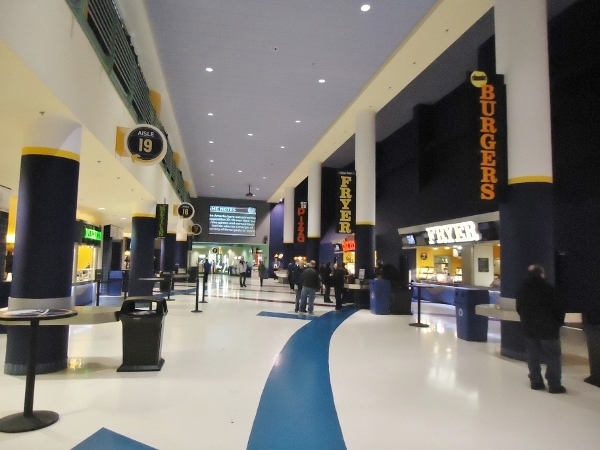 Honor Your History: As it is the home of the Sabres it wouldn’t hurt to inject more – or any, really – of the organization’s 45-year history into the main concourse. The museum-type exhibit installed on either side of the Blue Zone bar for the 40th anniversary season was a nice touch, but those two banks of displays have been covered up. The Aud Club is cool and they could actually stand to toss some more historical nods into that area. There’s no reason they couldn’t find other areas to show off team/arena history, but the Aud Club is certainly a good place to start. I’d actually love to see the organization find a way to potentially expand The Aud Club a bit. Patrons spill into the walkway on a nightly basis and cause foot traffic to slow. If there’s an effective way to keep some of those fans from spilling out, I’d like to see it happen. Eliminate Bottlenecks: The two common areas nearest the atrium are nightmarish to navigate on gamedays. I’m not sure what the solution is there aside from relocating some of the concessions in the area to keep so many people from milling around, but I’m not sure that would do the trick. Either way, that part of the arena is brutal as is the walkway directly outside The Aud Club. I’d owe the Sabres a debt of gratitude if they found a way to thin out those areas. Overhaul Concession and Apparel Stands: The current concession and apparel stands look quite nice at the moment. If nothing was done to them there’d be no complaints from me. However, as much as this will pain people to read, if the organization is looking for more modern, money making outlets, adding more features like the Southern Tier bar is the way to do it. I’m sure more unique areas for fans to interact (and spend money) will be high on the organization’s list. I’ll be interested to see how they choose to utilize the space they have to do this. I’ve always liked the food court area, but perhaps more unique spots to grab food will be on the way if the 100 level is renovated. Note: I’ve seen a few games at CONSOL Energy Center and I was impressed to see bars and concession areas in their upper level that you’d only expect to see in a main concourse or club level. The Sabres could stand to give the 300 level some TLC in the near future but since that didn’t come up at previous summits, I’ll stick to the 100 level for now. Add Small, Unique Features: The Blue Jackets have a cool Hat Trick Bin that they use to collect hats throw after hat tricks. 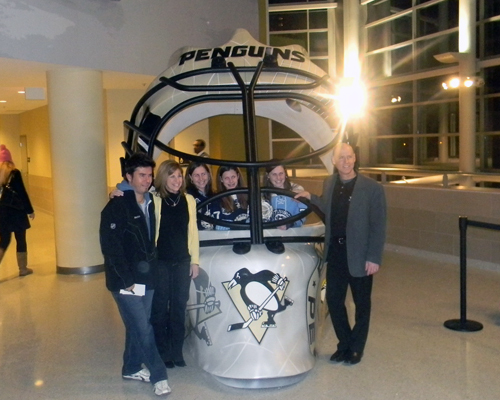 Numerous teams feature high school teams from their city or state while some teams provide photo-op locations like this enormous goal mask. The Sabres don’t need to copy any of those but I’d like to see them find a unique feature to add in. Maybe that’s an unparalleled section for those highlights I mentioned earlier. Perhaps it’s something on Buffalo’s history as a city. Just maybe not Sabrestooth’s house. Death to the Patio: Perhaps the most regrettable addition to the arena is the patio that overlooks the corner of Seymour H Knox III Plaza and Perry. It’s never used, like, ever and could otherwise be a nice addition to the Harbour Lexus Club or the upper atrium. One thought I had recently was to build a second floor for the Sabres Store in that space, with that second floor serving in the place of the new New Era store that recently opened on the opposite side of the atrium. My thought process there was not only expanding up onto the patio deck but to do so with a cool feature that would benefit the arena on game days and off days. The staircase along Main/SHK III Plaza could remain if fans wanted to check out the store on off days and the exterior portion of the expansion could feature unique Sabres and New Era artwork. That, obviously, is more of a pipe dream than the rest of this, but it was certainly a cool thing that could’ve been done. Either way, let’s hope the Sabres find a realistic use for that patio that doesn’t leave people exposed to the Buffalo winter during the months of December to March.